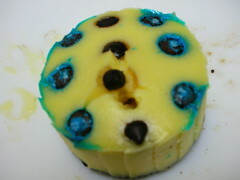 I got this from the Internet, as I was looking for a quick and easy cheesecake to whip. But unfortunately, I totally forgotten the source. So sorry.. x dapat bagi credits. Ingredients: Oreo Biscuits, 250g cream cheese, 1 egg, 1/4 cup sugar 1 tsp vanilla essence, chocolate chips. 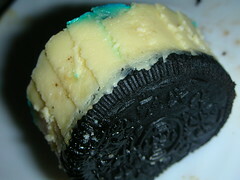 Put half of an oreo biscuit in a baking cup (for cupcakes). Mix cream cheese and sugar till white and fluffy. Pour the mixture into the cups filled with oreo, sprinkle some chocolate chips* and bake for about 20-25 minutes. *Alternatively, you can top with blueberries or any other topping. 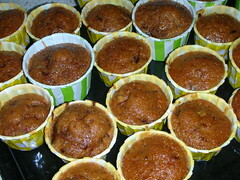 The cake is best eaten when cooled and chilled overnight. I got this recipe from youtube. But I altered it a little bit, reducing the sugar and replacing pecan with walnuts. Sift flour, baking powder, cinnamon and salt. Combine in sugar. Mix the dry ingredients with eggs, one by one. Pour in the vanilla essence and the oils. And stir. Fold in the chopped walnut and raisins, and lastly fold in the carrot. Pour into a baking pan and bake for about 30 – 40 minutes. Cake is best eaten with a cream cheese topping. (Which I am so lazy to prepare, as usual). This recipe was passed down to me by my mother. She gave it to me when I was in search for the yummiest chocolate cake recipe. I was considering whether or not to share this, but I thought, what the heck.. if I don’t, the internet is so full of it, anyway. What have I got to lose. As if I’m on cake business pon. If people make money out of this recipe, Alhamdullillah for them. Adalah “share” aku dalam menambah rezeki orang. Ingredients: 1 cup superfine flour (I’ve tried ordinary, superfine tastes better), 1 tsp baking powder, 1/2 tsp baking soda, 1/2 cup cocoa powder (use the better brand to guarantee a chocolicious cake), 1 cup sugar, 1 tsp vanilla essence, 1/2 tsp salt, 1 egg, 1/2 cup oil, 1/2 cup evaporated milk, 1/2 cup boiling water (must be boiling, ya). Sift the flour, baking soda, baking powder and cocoa powder. Pour in the sugar and salt. Pour in all the wet ingredients (egg, oil and milk) except boiling water and stir. When everything is evenly mixed, pour in the boiling bit by bit and stir until all the water have been mixed. You should have a flowy mixture. Pour into a baking pan (I use and 6″ round pan) and bake for about 40 minutes. 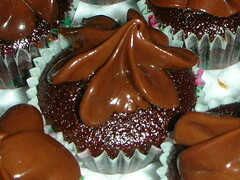 Cake is best eaten with a chocolate topping or ganache. So, happy baking and all the best! i guess i am lazier than u. haha. reading these few lines pun aku dah rasa susah! hoho. Beb, senang gila lah. Especially the last cake. Bak kata Chef Gusteau (of Rattatouille): “Anyone can cook”.. or in this case, bake! Gosh, thanks for sharing the recipes. A must try-lah. 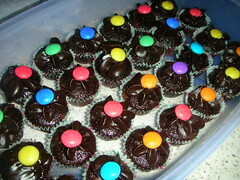 Aku rasa yang first recipe tu kalo tak nak bagi nampak M&M yang tak serupanya lagi, leh letak topping ey? Hmm, resipi kek coklat tuh ko pakai vege oil eh? fique: haah, yang cheesecake tu letak topping apa pon ok. erm, kalau tak nak letak vanilla, perah lemon juice pon ok.. tp vanilla is easier to get around the house. kek coklat tu, saya pakai minyak kelapa sawit. kira vege lah kan? heheh. corn oil pon ok.
i know the cakes look tasty, especially cheese cake. can you share the pix of your baking equipment tak? ida nk shopping barang2 sometimes wonder which is appropriate and sufficient to buy? Put half of ????? and oreo biscuit in a baking cup (for cupcakes). kak klynn sila rujuk resepi satu yer.. ada bahan yg tertinggal ke? I meant half of an oreo. saya dah cuka resepi kek coklat tu.. memang sedap. ramai yang suka.. saya buat 2 adunan. 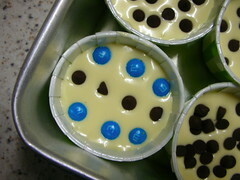 Kemudian cut half, letak cream cheese filling dan kemudian top with choc ganache..
cik daun: alhamdullillah. fyi, kek ni boleh kukus gak.